At some point on Tuesday, the group reiterated its determination to bring down the New York Stock Exchange. Spokespersons with NYSE said their policy is to not comment on security matters; however, if there were problems on Tuesday, they were minimized as there were no problems that outsiders noticed. Some are concerned these minor hacks are just a bit of what might eventually happen. There are fears, albeit rather grand fears, that if the right groups come together, they could cause devastation to the grids in America, especially considering all of the political and social unrest going on in other parts of the world against the United States. The problems with the websites at the two banks came after one unnamed source posted a carefully worded statement on the Internet. In it, there were threats to to attack Bank of America and the New York Stock Exchange. Citing it as a first step against American companies, the statement said the attacks would continue until the YouTube video that caused such controversy over the past two weeks had been removed. It’s that video that has stirred so much controversy – and none of it good for the United States. It appears the group has kept its promise as on Wednesday, both J.P. Morgan Chase and NYSE Euronext experienced significant website trouble. The stock exchange had previously been targeted by the group Izz-ad-din Al qassam Brigades as it said following the Bank of America attack that it was its next stop. There’s been no confirmation that JPMorgan Chase was on the “hit list”. An intelligence network that gathers information related to cyber attacks, Flashpoint Partners, said it believes the Chase attack was due to a “sustained denial of service attack” and that it probably has to do with a “large botnet”. These are often used by the infamous hacking group Anonymous. These botnets control many computers at once while compromising the security without being noticed. Regarding the stock exchange, it says a group that calls itself “SaudiAnonymous1” is responsible and it used a webhive. While only a few Americans found trouble accessing the stock exchange’s site on Wednesday, the problems did last for about an hour before it was resolved. It wasn’t considered widespread and appears to not have compromised the trading systems. As a result of these breaches, the financial sector saw its threat level raised to “high” from “elevated”. This, of course, was due to the recent credible intelligence it had been receiving. 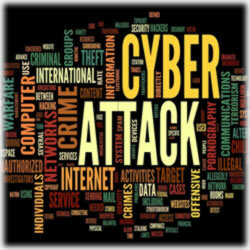 Not only that, but warnings were issued for potential DDoS and other various cyber attacks. All banks and financial institutions were warned to maintain the “highest level of awareness”. The warning encouraged those affected to keep up with the ever changing updates while also maintaining diligence in watching for patterns on their respective websites. If you’re a Chase credit card or bank consumer, and if you attempted to log into your account on Wednesday, odds are you were greeted with an error message. Customers could not log into their accounts until around 6 pm. on Wednesday evening. Meanwhile, the bank confirmed it had been hit with “intermittent issues” and that it apologized for any inconvenience. It also reiterated its commitment to looking out for its customers as well as working to ensure each account’s safety was maintained at all times. It’s believed the outages with Chase began around 8:30 a.m. central time, according to Sitedown.co. While it’s not been confirmed Bank of America’s outages were a prelude to what those hackers are capable of, there is belief that the same group is behind all three hacks. While Izz ad-din Al quassam Brigades took credit for the BoA hack and threatened the stock exchange, it didn’t specifically say it would also be targeting JPMorgan Chase. Still, if the group maintains its promises, it’s only the beginning. Often these DDoS attacks are part of a more sophisticated blended threat – one that utilizes DDoS as a diversion for more complex, difficult to detect techniques with the intention to extract customer data or financial information. An FBI spokesperson wouldn’t say if there was any link between the fraud alert and the bank problems on Tuesday and Wednesday, though it appears the two are connected. The message was clear though: maintain consistent and priority diligence. It’s the only way to ensure a quick response to these “malicious events”. There were also other banks and financial institutions specifically named, including Morgan Stanley, Citigroup, Goldman Sachs Group as well as several insurers including State Farm and Allstate. The two credit card companies mentioned were Visa and MasterCard. Interestingly, the FBI also cited a Microsoft warning that says hackers have attacked some of its customers by using a security bug for those who use Internet Explorer browsers. Remember, the group claimed an alliance with Muslims and said it too was angered over the recent YouTube video that mocked Islam. That same video was the justification used to kill four Americans – 2 of whom were American Marines. There’s no definitive way to confirm the group has actual ties to any terrorist group, including Izz ad-din Al quassam. As of press time on Thursday, JPMorgan had yet to release any kind of presser or comments. Are you a Bank of America or JPMorgan Chase customer? If so, have you experienced any difficulties logging into your accounts? Let us know – we’d like to know your experience.